Rene Lichtman in his home studio. 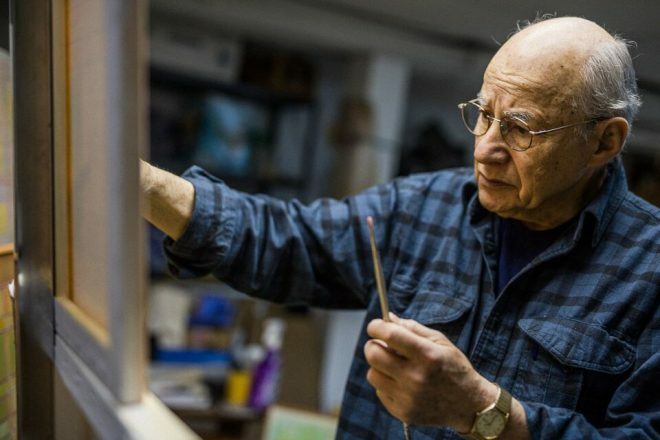 Local Holocaust survivor, speaker and activist Rene Lichtman is ready to show another dimension — artist. Rene Lichtman is a Holocaust survivor, a hidden child outside of Paris with a non-Jewish family. He was baptized and didn’t know he was Jewish until his mother came for him after the war. He’s the co-founder of a local group called Hidden Child/Child Survivors. 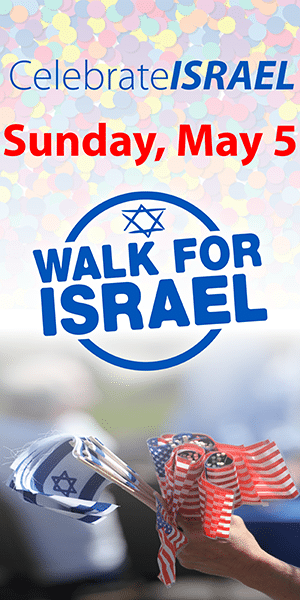 He’s also a co-founder of the World Federation of Jewish Child Survivors of the Holocaust. He speaks often about the Holocaust locally — to students at Hillel Day School, to visitors at the Holocaust Memorial Center in Farmington Hills and at senior homes — and nationally. He is a natural storyteller. And he has a breathtaking story to tell. But Lichtman doesn’t want to talk about that. Rene Lichtman wants to tell a different story — about art. 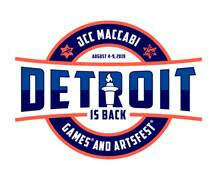 Lichtman, 80, is the subject of a one-person exhibit at the Lawrence Street Gallery in Ferndale. 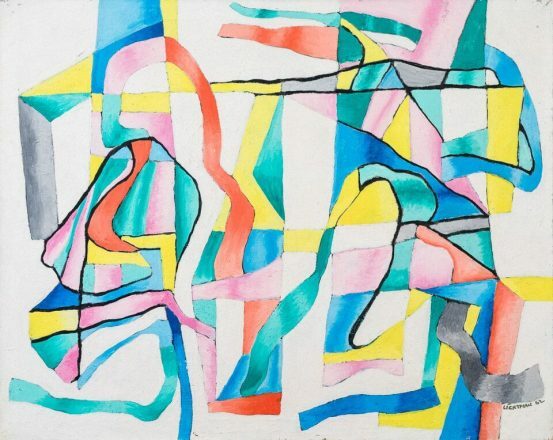 “Rene Lichtman: A Retrospective 1960-2018, Paintings & Collages” opened May 2 and will run through May 25, with an opening reception on May 4; a mid-month reception and artist’s talk will be held May 20. But it is all connected. Lichtman was born in 1937 in Paris, where his Polish parents had fled the year before. His father, wanting to help the fight against the Nazis, took up arms for the French army. During his service, he befriended a Catholic family in Le Vert Galant, outside of Paris, who agreed to take in Rene should anything happen to him. Lichtman’s father was killed in battle. His mother gave over temporary guardianship of Rene to the family, who raised him, lovingly, as their own — and Catholic — while his own mother also went into hiding. 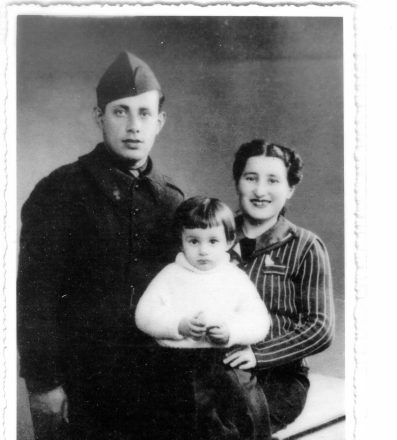 Rene in France with his parents, Jacob Lichtman and Helen Zajdman. After France was liberated, his Yiddish-speaking mother came for him and Lichtman learned he was Jewish — but continued to visit his beloved adoptive parents during summer breaks from school in Paris. In 1950, Lichtman’s mother remarried and they moved to the United States, settling in Williamsburg, Brooklyn. There, entering sixth grade as Ronnie — his classmates and teachers had trouble pronouncing Rene — 13-year-old Lichtman earned two awards from his art teachers. 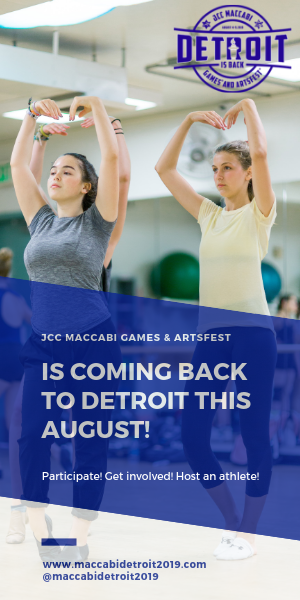 After graduation, Lichtman went into the Army, where he continued to paint whatever he could — including sets for performances — and had a show in the Army. Returning home to Brooklyn, Lichtman entered Cooper Union School of Art in Manhattan’s East Village. 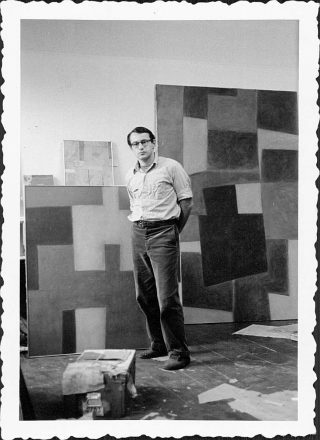 Winning a scholarship, he spent a couple of summers in Provincetown, Mass., where he worked as an assistant to artists Robert Motherwell and his Jewish wife, Helen Frankenthaler. Motherwell was part of the New York School, which also included Philip Guston, Willem de Kooning, Jackson Pollock and Mark Rothko. 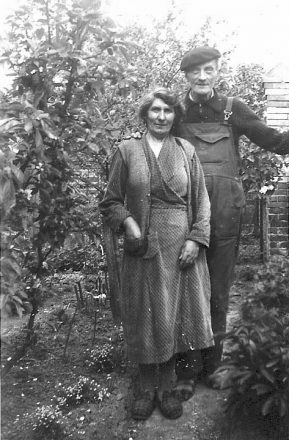 Lichtman’s French parents, Anne and Paul Lepage. “After the war, all these artists and teachers came to New York and created the New York School,” Lichtman says. “So there were all these influences — Surrealism, Automatism, avant-garde movements, Abstract Expressionism. And it all influenced American art. In Provincetown, Lichtman stayed away from the party atmosphere. “I didn’t go to any of the bars,” he says. “I kept kosher, but didn’t know it — I just did what I knew. “They had a studio — Motherwell rented a huge pool hall that had been torn apart, no pool tables. It was just a huge space with huge paintings with very simple, geometric stuff in the middle,” he says. “He would say to me, ‘Give me three tubes of paint, yellow, ochre and blue, mix them together. I want you to paint this area, no brushstrokes, just flat.’ He would do those nervous edges. It was so big that I could do that. So I painted Robert Motherwell’s paintings. “Frankenthaler brought me in sometimes to do shipping,” Lichtman says. “And Norman Mailer had a house down the street — sometimes I’d cut his grass. 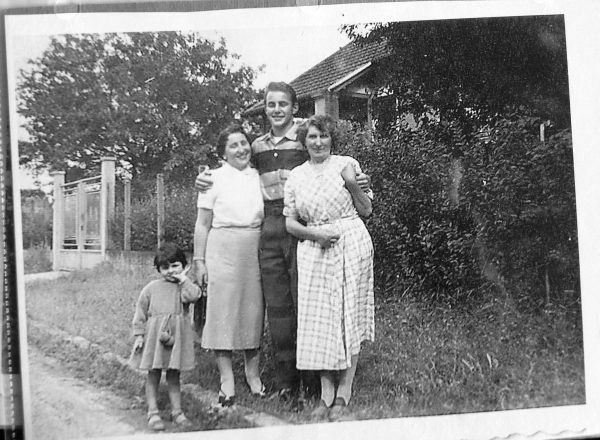 Lichtman with his two mothers, Maman Helene and Maman Nana. He also looked at Lichtman’s work — and then gave him a recommendation to the Fullbright Scholar program, which allows an American student to study abroad for a year. Frankenthaler happened to be on the deciding committee. When Lichtman won his Fullbright scholarship, he decided to go to Brussels — because he was born in Paris, he wasn’t allowed to go there. Lichtman in Brussels, where he had his first one-person show, on a Fullbright scholarship. Lichtman returned to New York in 1965, during the Vietnam War. He was having trouble painting and got involved in a film group making newsreel documentary films that did work with the Black Panthers, which brought him to Detroit during the riots. Eventually, Lichtman married his wife, Cathy, had children, and worked in the auto industry until they both went back to school. He earned a Ph.D. from Wayne State in instructional technology — “it took me eight years” — then worked in nursing education at Beaumont. But he always kept a studio and he always continued to paint. 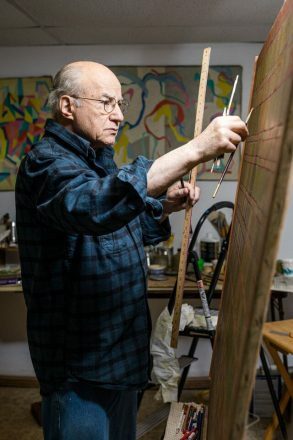 “I have paintings dating back from 1962,” Lichtman says. “I was involved in Surrealism, in the Belgian School — and there’s always the mix of being a survivor. “But I never did Holocaust art. I was more influenced by schools. It’s like these two different personalities — I’m interested in balance, harmony, relationships. It’s very much about reason; it’s not expressionistic. It’s geometry, but it’s soft geometry,” he says. “I’ve always worked in the abstract tradition, beginning with Expressionist influences but then moving into the geometric realm. 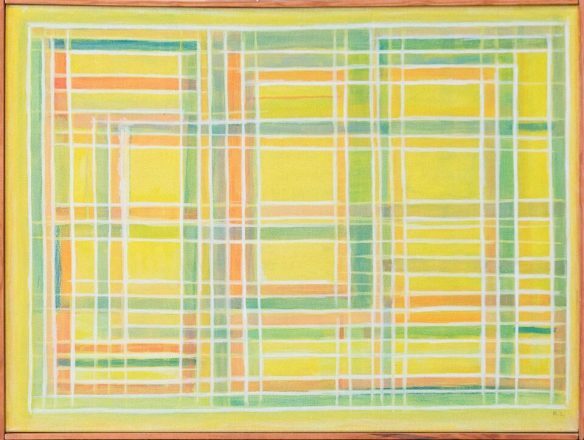 My early painting was influenced by the New York School and the early Russian Constructivists, but eventually people like Rothko and Diebenkorn, who combined the geometric tradition with a softer, more painterly touch came along. That is the quality I strive for today. 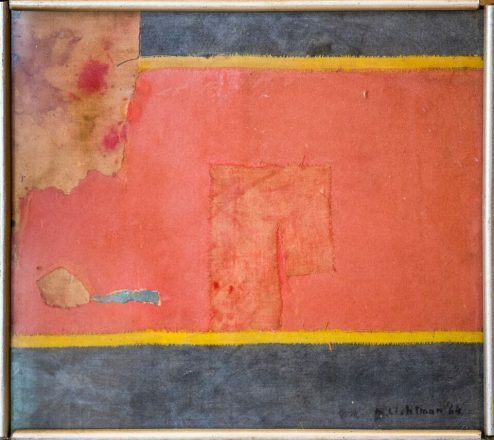 An enormous Rothko-inspired collage dated 1964. “Because of my childhood and my history, I’ve always been very political. My whole world, all the Jews I knew, were very ‘left.’ Working class, Workman’s Circle, Yiddish-speaking people. So people who know that side of me say I’m very nice on the outside but very violent on the inside. “But I’m not an angry painter,” he says. “I love solving problems. I was this kid with a very chaotic life — my childhood, then living with my stepdad, this guy I didn’t know. So my art is the opposite of chaos. As in life. When Lichtman does speaking engagements, he tells his story, with photos of his childhood, and he gives the facts, straightforward. “But in the end, I do talk about ‘lessons learned,’” he says. “I talk of the two Righteous Gentiles who saved me and my mother, and the responsibility of the audience to fight against injustice today. An early 1960s oil painting, titled Gorky’s Garden. 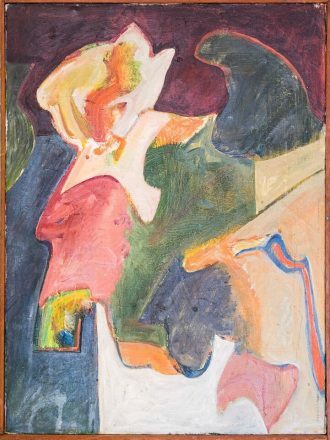 “Rene Lichtman: A Retrospective 1960-2018, Paintings & Collages” will be on view through May 25 at Lawrence Street Gallery in Ferndale. An opening reception will be held 6-9 p.m. Friday, May 4; a mid-month reception will be 2-5 p.m. and an artist’s talk at 2 p.m. Sunday, May 20. (248) 544-0394.